Magic 7s Scratch Card Review - Casino Answers! 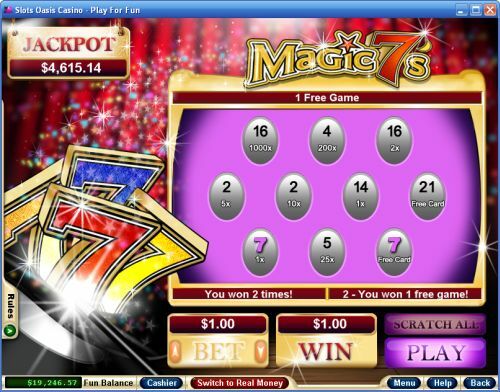 Magic 7s is an online scratch card game developed by Realtime Gaming, featuring multipliers and a progressive jackpot. You can play the Magic 7s instant win scratch card game at Bovada. The Magic 7s casino game is a dollar scratch card game. Bets on the Magic 7 scratch and win game are $1, $2, $5 and $10. The Magic 7s scratchie has a decent betting range for most online scratch lottery ticket players. To win, you must reveal a “7” under any of the symbols and you will win the prize shown with the “7.” If a Magic Hat is revealed instead of a “7” symbol, your win on the Magic 7s instant win scratch card will be doubled. You can get multiple wins (up to 10) on the Magic 7s scratch ticket. To play the Magic 7 scratch card, select your bet with the up and down arrows on each side of “Bet” and press the “Play” button. Then, you have the option of using the “Scratch All” button to reveal all of the symbols yourself or you can click on each square to scratch them manually. Magic 7s features a scratch card progressive jackpot, which at press time was at $4,615.14. To win this jackpot, all you have to do is play the Magic 7s scratch card. The jackpot is triggered at random, so you don’t even need a winning scratch card to win the Magic 7s Progressive Jackpot! To play for this jackpot, simply play the Magic 7s scratch card specialty game at Bovada! There are 14 winning prizes on the Magic 7s online scratch card. The complete payout schedule is as follows: 1X, 2X, 3X, 4X, 5X, 10X, 15X, 20X, 25X, 50X, 200X, 500X, 1000X and 3000X. You can win up to $60,000 on the Magic 7s instant win scratch card game. The Magic 7s scratch card is a very easy game to play. Games are fast and a lot of fun to play. You can play the Magic 7s scratch card when you sign up today at Bovada! Can players from the USA play the Magic Sevens scratchie game? Yes, American players and players from the United States of America are most welcome to play the Magic 7’s online scratch ticket at RTG online casinos like Bovada. Is there a Magic 7’s flash game available that I can play for free? Unfortunately, there is no flash game available for the Magic 7s scratch card. For a good selection of scratch card flash games that are USA-friendly, please visit Bovada. For non-USA players, you can also visit Bovada for a great selection on online scratch card flash games.